The five books in the "Harry Potter" series have collectively sold a quarter of a billion copies, author J.K. Rowling's agent said. Rowling's stories chronicling the adventures of a boy wizard have been translated into 60 languages and sold around the world. She's working on the sixth installment and plans seven in all. "We are delighted J.K. Rowling's books continue to win new fans internationally and look forward to introducing Harry Potter to yet more readers in the farthest parts of the globe," her agent, Christopher Little, said Monday. The series has been a shining example of marketing wizardry. Having already conquered the children's market, Scholastic, Inc., the U.S. publisher of Rowling's multimillion-selling series, took to targeting adults, ages 18 to 35. Potter ads featuring bikers, skateboarders and couch potatoes were placed in Rolling Stone and other magazines throughout October. 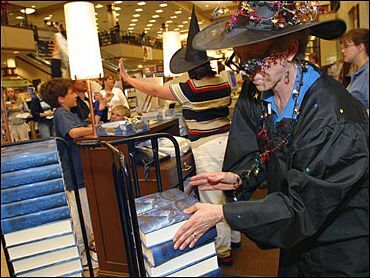 "We felt we needed to think out of the box and reach out to readers who would not normally pick up a copy of Harry Potter unless somebody placed it in their hands," Barbara Marcus, president of Scholastic Children's Books, said. Rival publishers said they have never heard of a children's book being advertised in such a way, but praised Scholastic for doing so. "It sounds very funny and witty," says Lisa Holton, senior vice president and publisher of Disney's children's books division. "I think it's fabulous Scholastic is going after that audience. ... A lot of us, I would think, are rooting for Scholastic to do really well." And grown-ups have long been an important market for the Potter books, with a consumer study released in 2000 showing that 43 percent of purchases were made by adults. "But there's a strong 18-35 demographic that may not have come into contact with Harry, people who probably don't have children," Marcus says. One ad shows a dark-eyed woman wearing a sheer, sleeveless dress and shopping for shoes. "There are some pretty stylish things in Harry Potter — invisibility cloaks, i.e., the only item that goes with everything in a girl's closet," the caption reads. "That's just one of the fabulous reasons so many fashionistas are totally cool with being seen toting Harry Potter."